It’s definitely summertime here in St. Louis, so this means it’s time to try out some new gelato flavors! I had a couple of friends over for pizza the other night and served this gelato for dessert. The consensus was this recipe is a keeper. 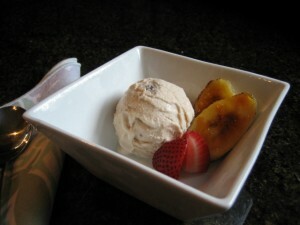 The sweetness from the strawberries and caramelized bananas allowed me to reduce the sugar in the mixture. Cook’s notes: Despite the very light pink color of the gelato, it had a distinct strawberry flavor. Bananas are a classic combination w/ strawberries – caramelizing them lended a bit more complexity to the blend.